Having created the first-ever trading card game – Magic: The Gathering – and the asymmetric cyber-showdown Netrunner, sometimes proclaimed as the best card game ever made, Richard Garfield is no stranger to truly groundbreaking card games.Even so, his next project might be his most ambitious design yet. KeyForge: Call of the Archons starts with a familiar setup: two players, head-to-head, playing cards to knock out their opponent. But the game has a brand new trick up its sleeve when it comes to the cards that players are using. One that’s totally unique – literally. 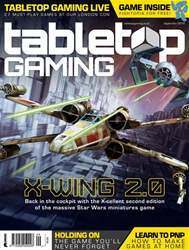 KeyForge is what publisher Fantasy Flight describes as the first ‘Unique Deck Game’. The idea? Every single player has a deck like no other. Not just the two people playing in a single match – every person that owns the game. In fact, there’s apparently 104,000,000,000,000,000,000,000,000 possible deck combinations in the game’s first set, or 104 septillion if you can’t remember how many zeroes that is. Every pack brought by a player will feature a different deck that only they have, made up of three of the game’s seven houses – but the catch is that it can’t be customised, so you’ll have to get a completely fresh deck to try something new. A free companion app will let you register your one-of-a-kind deck, find tournaments and check out other players’ decks to see how the meta’s evolving. There’s an original twist when it comes to gameplay, too. Players can only use cards from one of the houses on each of their turns. Cards don’t cost anything, so the only limitation to what you can play is how many cards of a certain house you have in your hand. Commanding your army of creatures are the powerful Archons, and each house has a distinct play style – not unlike Magic’s coloured mana. Cards can be used to fight rival creatures and players, or gather the resource of Æmber, which is used to forge one of the three keys needed to win. 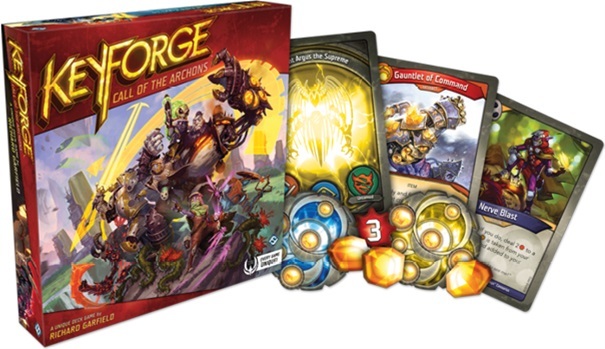 KeyForge is planned for release during the last quarter of 2018, but you will be able to get an early look at the new announcement from Gen Con and try it for yourself at the Tabletop Gaming Live convention in London’s Alexandra Palace later this month. The show takes place on September 29th and 30th, and tickets are available now.